(CNN) -- Serbia's Novak Djokovic made no mistake in his opening round match at the China Open in Beijing as he saw off Romania's Victor Hanescu in straight sets 6-3 7-5 on Monday. 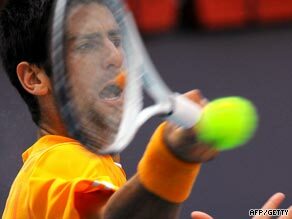 Djokovic powers a forehand during his straight sets win over Hanescu. Djokovic was behind to an early break, but improved to lead 4-2 before closing out the first set. The second set remained on service until the 11th game where world number four Djokovic finally made a breakthrough. The second seed served it out, clinching victory with a forehand winner against world number 27 Hanescu. "I was happy overall with the way I played. It's just that I thought I could have finished the job earlier," Djokovic told reporters. In other first round action in the ATP tournament, Germany's Philipp Kohlschreiber saw off the challenge of big-serving Croat Ivo Karlovic 7-6 4-6 6-1 and France's Julien Benneteau dispatched Marcos Daniel of Brazil 6-3 6-4. Top seed Rafael Nadal, who won the tournament in 2005 and also claimed Olympic gold at the same venue last year, is set for a mouthwatering first round clash with Marcos Baghdatis of Cyprus on Tuesday. Beijing organizers have secured a $6.6 million prize pool for the joint ATP/WTA event which has attracted the Dinara Safina and Serena Williams on the women's side and a strong entry in the men's draw.